Plant collections, centrally housed in herbaria, are the main resource for the study of plant taxonomy and distribution. Plant collecting seems to have fallen out of favour in recent years with the introduction of high quality digital photography. While photographs suffice in certain circumstances, and are perhaps preferred for certain taxa that are very rare, they can never replace the value provided by collections. The SKCDC, with the support of the members of the Botanical Assessment Working Group, would like to encourage appropriate plant collection for a number of groups that require more information for study. Herbarium specimen labels reflect changes in knowledge of taxonomic classification over time. Photo courtesy of the W.P. Herbarium. Collections provide permanent records that remain available for additional study as knowledge changes over time. Not only can they be used to help determine the best taxonomic classification (whether through morphological or molecular studies), they serve as a learning resource once those classifications have been determined. They also provide a permanent record of the existence of that taxon at a particular site. The SKCDC makes use of collections in its ranking process, as those collections provide data on the distribution of taxa and how common or rare they might be. Specimens provide the best support for a particular subnational rank as they can be easily verified. See the SKCDC's ranking page for more information. Because they are a form of destructive sampling, collections must be conducted in an appropriate manner so as not to impact the taxon or habitat it creates or is found in. The Ministry of Environment, in its Rare Prairie Plant Species Detection Protocol (2015), uses the 4% rule as a cutoff for plant collections, that is, there must be at least 25 individuals at a site so that collection of one individual will result in the loss of 4% (or less) of the local population at that site. There are cases, however, where the removal of part of the plant does not kill the individual, and therefore may not be subject to that rule. This may include shrub species, where a branch can be removed but the individual remains, and perennial species if the roots are left intact. For an annual species, if its propagules have already been dispersed, then the individual has already fulfilled its life cycle and collection may only impact the habitat from which it's taken (of course, flowers and fruits are usually the most important identifying features of a plant and generally need to be collected to make the specimen most useful). Botrychium individuals may be collected if their spores have been dispersed and their stems are cut at ground level. Assistance with collecting for the following groups is being encouraged: members of the Crataegus (especially from southwestern Saskatchewan and the Cypress Hills area), Botrychium, and Potentilla genera. Collections of Carex tenera from southeastern Saskatchewan, as well as Cryptantha celosiodes (Oreocarya celosiodes) and similar taxa (but not Cryptantha minima) are also sought. 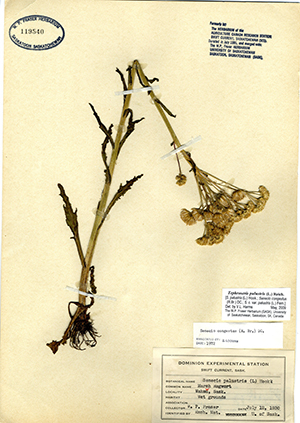 Collectors should use the most up-to-date taxonomic classification (e.g., the Flora of North America in many cases) when identifying their material before submitting it to the herbarium. Collectors should also follow appropriate steps to collect, preserve, identify and submit their material to the herbarium in a standardized manner. Collections made in Saskatchewan should be sent to the W.P. 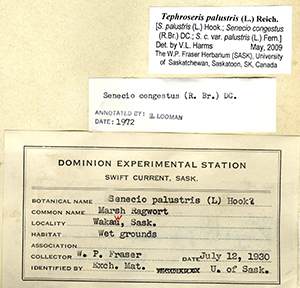 Fraser Herbarium (SASK) at the University of Saskatchewan. The herbarium offers this document as a reference for proper collection. Readers should note that if they are collecting plants in the course of their business (e.g., research or field surveys in advance of potential development projects), they may be required to obtain a permit from the Fish and Wildlife Branch, Ministry of the Environment. Please see the Research Permits page for more details. Collections are an invaluable resource in the study of our flora and the conservation of our natural history. Conducted appropriately, they will not negatively impact the local population being sampled yet provide a wealth of information for posterity.